ton was deeply interested in opening a waterway across the mountains of Western Maryland. The canal that he proposed would have connected the American seaboard with the Western frontier, thus binding together the pioneers of our mountains and the residents of our older Tidewater settlements. Political as well as economic reasons lay behind his concern with the problem. Washington feared that, since Spain and France controlled commerce on America's inland water routes, the hunters and pioneer farmers advancing into the mountains might shift their allegiance to foreign nations. In 1774 the Virginia Legislature, largely through Washington's efforts, passed an act to make the Potomac River navigable to Will's Creek—that is, as far west as Cumberland. Maryland's objections disrupted the plan, and soon afterwards the Revolutionary War ended all discussion of the problem. 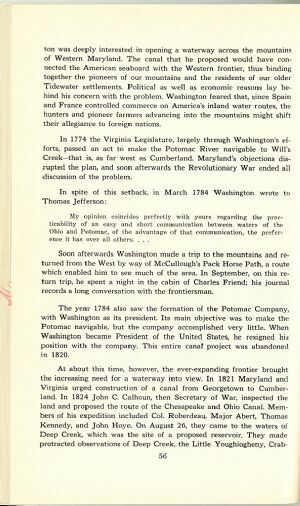 Soon afterwards Washington made a trip to the mountains and returned from the West by way of McCullough's Pack Horse Path, a route which enabled him to see much of the area. In September, on this return trip, he spent a night in the cabin of Charles Friend; his journal records a long conversation with the frontiersman. The year 1784 also saw the formation of the Potomac Company, with Washington as its president. Its main objective was to make the Potomac navigable, but the company accomplished very little. When Washington became President of the United States, he resigned his position with the company. This entire canal project was abandoned in 1820.